How Do I Make the Taskbar Smaller or Larger? - Ask Leo! How Do I Make the Taskbar Smaller or Larger? It's easy to make the Windows taskbar smaller or larger - perhaps too easy, since it can happen by accident. I'll show you how to change it and how to lock it. How to reduce the size of the strip at the bottom of the Windows desktop window? That “strip”, as you call it, is the Windows taskbar. Most folks don’t realize it’s really a special window, of sorts. And as a window, you can resize or even move it. Sometimes people are even surprised when that happens by accident. Since it can happen by accident, Windows includes the ability to lock the taskbar. Start by right-clicking on the taskbar. Look for the setting “Lock the taskbar”. The resize will happen in steps. To start, make sure your taskbar is unlocked. Hover your mouse over the top edge of the taskbar, where the mouse pointer turns into a double arrow. This indicates that this is a resizeable window. Left-click the mouse and hold the mouse button down. Drag the mouse up, and the taskbar will, once your mouse reaches high enough, jump to double the size. You can go even larger if you like. We normally think of the taskbar being along the bottom of the screen, but it doesn’t have to be. Particularly on wide screens, you might prefer to have it on the left. While it remains unlocked, just click and hold on any empty area in the taskbar and drag it to whichever side of the screen you’d like. Finally, when you have the taskbar where you want it, and the size you want it, be sure to right-click on it and make sure that Lock the taskbar is checked once again. Based on what I hear, it’s fairly common that the taskbar gets unexpectedly resized or moved. Locking the taskbar simply prevents that from happening. All your images in this article are broken. And is there any way of making Windows 7s taskbar any thinner than the minimum? Images are back, sorry about that. You can make any task bar one button high, or zero buttons high, as you can (now) see above. I know of no way to go half way or make the buttons smaller. It did not work with my WIN7 even though the taskbar was unlocked. I could not change it in size. One option in Windows 7 is to right click the taskbar and select properties. You have several options you can select. One is for “Use small icons”, and another is to “Auto-hide the taskbar”. See if these help. 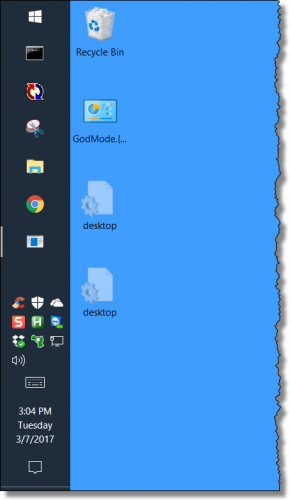 While the taskbar is unlocked, try resizing the quick launch toolbar wider so that the icons aren’t stacked above each other. Just click and drag that divider next to the quick launch toolbar. I think I might have commented before but when I go into Hotmail with my Chrome browser the Task bar disappears. I can bring it back with the Windows key but it doesn’t stay. You also lose the Links bar and the Address bar is unresponsive. I usually end up dumping the browser to regain control. I don’t know whether it’s Google or Microsoft or both at war over a non Microsoft product accessing a Microsoft site. There’s no problem with either Internet Explorer or Firefox. Hi. On my Windows 7 taskbar (either locked or unlocked), in the Quickstart area, the icons all have separators – takes up a log of space. Can I get rid of those? Enlarging the task bar doesn’t help me to see the icons unless the icons themselves are enlarged. Is it possible to do so and then “lock” then new size? Unable to reduce taskbar even with instructions. Please help me. Thanks. I don’t want to just make the task bar larger, I also want the icons themselves to be larger! This just puts more junky space on my desktop! Any help? Depending on your version of Windows right click the taskbar, click on “Properties”, and in assorted settings you may find an option to use “large” or “small” taskbar icons. Those are the only two options I’m aware of. Note that on a Windows 10 tablet with an unlocked taskbar it is very easy to make the taskbar bigger by accident … and impossible to make it smaller again via touch. You can’t get the double-headed “resize” arrow via touch. So when this happens you need to hook up a mouse or the touchpad to get back to the one-line taskbar. Kind of ridiculous. Thank you so much for your easy-to-do help!! I ended up by accident with a rather “fat” toolbar, and it was solved so simply! I followed the instruction and it simply work. The taskbar was not initially locked. Thanks. 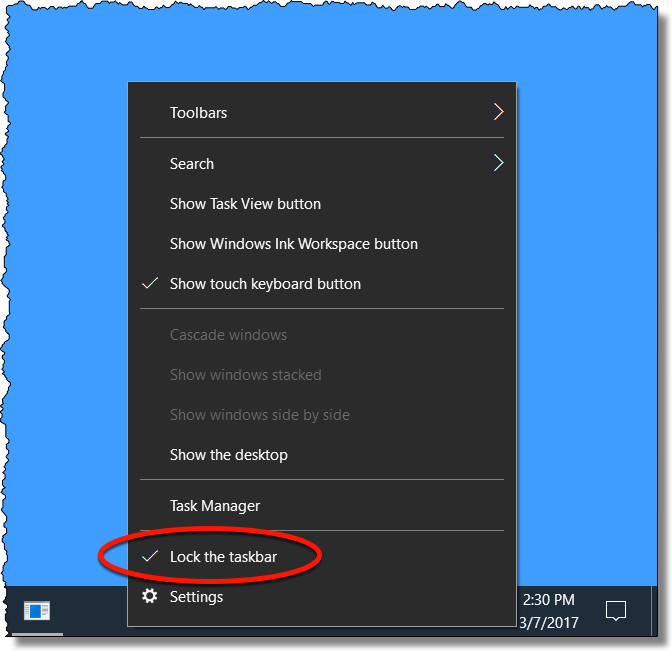 Right-click on a free spot on the Taskbar and select “Taskbar settings”. Where it says “Use small taskbar buttons.” Click the toggle button to turn it off. Depending on your version of Windows, right click on Taskbar and click on properties or settings. There should be a setting to use small icons. Make sure that’s NOT selected. I have Windows 10 and when I click on the taskbar, only 5 options are shown, and LOCK THE TASKBAR is not one of them. Is there another way make the taskbar icons a little larger? Also I just started having a problem with my letters not showing right away when I press the keyboard. It’s a laptop if that makes a difference. The letters will appear about 15 seconds later—sometimes. I think it’s time to take it to the repair shop. When I log on, now my desktop doesn’t show up either. If I didn’t have Google on my taskbar, I’d be out of luck. I still use XP. i dragged my taskbar up by mistake. i couldn’t get it down to size 1, 1=5/16 tall. then i read somewhere about getting the slider bar icons on top half of 2. after that taskbar would drag to back to 1. i locked the taskbar after that and should be good to go. it wasnt locked before. Thanks for your website. It helped me out alot on my RCA Cambio windows I finally moved my task bar back down and got it locked in place. Thanks again Leo for your site. Tried the toolbar resizing ,thanks for the help. I don’t have a mouse its a tablet and it has Windows 10 on it. This is so frustrating takes up so much of my viewing screen. Thank you Leo !!! You should be knighted as Sir Leo of Cyberspace. Thank you very much for this simple answer!